A recap of last night's Buffalo/Toronto game. 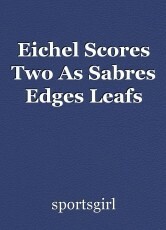 Jack Eichel, (above), scored two goals in last night's 3-2 Sabre's win. The Toronto Maple Leafs have to try again to get their 46th win of the season as the Buffalo Sabres won 3-2 last night. His teammate, goalie, Chad Johnson stopped 39 shots last night. Chad Johnson, (left), stopped 39 shots last night. The Leafs went ahead 2-1 in the second period with goals by Nazem Kadri and Patrick Marleau. It was Kadri's 30th goal of the season. Unfortunately for Toronto, Buffalo score two goals in the third period. Buffalo's Zemgus Girgersous had two assists in the game. Marleau finished the night with two points. Toronto hosts the Florida Panthers tomorrow night. New York Knicks; What Happened? Preview: Yankees Verses Blue Jays Game Two. This page was created in 0.4780 seconds.